Arthritis involves the breakdown of cartilage. Cartilage normally protects the joint, allowing for smooth movement. Cartilage also absorbs shock when pressure is placed on the joint, like when you walk. Without the usual amount of cartilage, the bones rub together, causing pain, swelling (inflammation) and stiffness. The joint pain which we know as arthritis is actually a collection of several diseases. The most common are osteoarthritis and rheumatoid arthritis. Osteoarthritis is a degenerative disease caused by wear and tear on the joints. It usually occurs in older people, and most often in the weight-bearing joints, such as hips, knees and spine. The slick cartilage lining the joint begins to erode, and finally becomes so rough that the movement is very painful. In rheumatoid arthritis, the membrane lining the joint, called the synovial membrane, gradually becomes inflamed, and eventually the whole joint becomes swollen and painful. Over time, the adjoining bone becomes weakened and parts of it may even be destroyed. The most usual targets are the knuckle and toe joints, but the wrists, knees, ankles, neck and other joints may also be affected. Rheumatoid arthritis can also attack the inner layers of the skin and the internal organs, including the heart. Although the cause is not known, most experts consider rheumatoid arthritis to be an autoimmune disease, which means that the system overreacts (often after a bout with the virus). Current research is beginning to point towards gingivitis as being the cause of many cases of arthritis. Researchers found that the rheumatoid arthritis patients were about four-and-a-half times more likely to harbor the DNA of the Porphyromonas gingivalis bacteria within their synovial fluid compared to the non-arthritic adults. One government study determined that fully half of the arthritis sufferers in the U.S. would not have the disease if they balanced their diets! 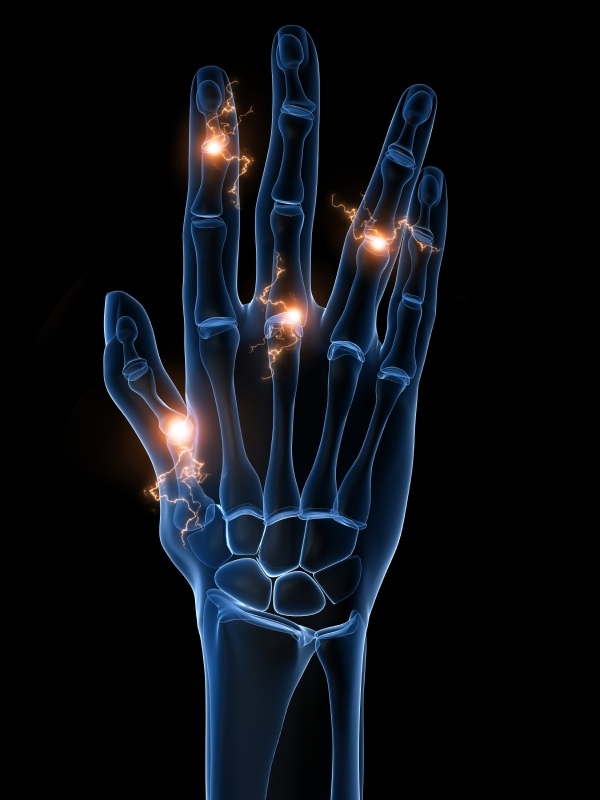 Arthritis is considered by many experts to be very responsive to nutritional treatment. Injury, metabolic abnormalities, hereditary factors, infections and autoimmune health-issues. Stress is a major trigger for rheumatoid arthritis. Read some good books on stress release, and consider stress therapy. A condition called Candida Albicans can cause autoimmune diseases, including rheumatoid arthritis. Ask your nutritionist whether this might be your problem. Vitamin D deficiency is associated with the developments of RA. Reports from the Iowa Women’s Health Study published in the Journal of Arthritis and Rheumatism in 2004 found that vitamin D intake is inversely associated with RA. The results showed that postmenopausal women who consumed at least 400 IU of supplemental Vitamin D daily had a 34% reduction of risk! Most experts recommend 5,000 units per day. An important underlying contributor to RA, almost universal in most autoimmune diseases, is traumatic emotional assault. Often such an event takes place before the age of five or six, but it can occur anytime in your life. Environmental Health Matters: A dry warm environment is beneficial. Try a de-humidifier in your home or bedroom. Arthritis is a disorder that responds incredibly well to diet. Following these guidelines will give you much needed relief. Acid-alkaline foods: Shifting the diet more toward alkaline-forming foods is very healthful in any case, and can be especially beneficial for arthritics. It’s possible that this may help dissolve deposits in the joints. Refer to the attached list of foods. Sugar: Sugar is one of the biggest culprits. In addition to being highly acidic, it uses up exactly the vitamins and minerals the arthritic needs most. Sugar also makes the blood sugar bounce around, which can aggravate the condition. Some arthritics have experienced a relapse from a single helping of sugar foods. Use stevia and raw honey in small amounts as a sweetener. Fats and oils are used by the body to make prostaglandins, some of which are powerfully anti-inflammatory. The arthritic needs cold-pressed oils, and the special fats found in high quality yogurt, kefir and raw butter. Nuts are detrimental to some people if not soaked first due to enzyme inhibitors. Plants in the nightshade family contain a chemical called solamine, which is very irritating to the joints. Avoiding these foods brings some people tremendous relief. These plants are potatoes, tomatoes, green peppers, eggplant, and tobacco. Tobacco and tomatoes seem to be the worst; later, when you are feeling better, you can try eggplant, green peppers, and the inside of potatoes (not the skin). Note: when a potato sprouts, solamine content in the entire potato rises. Citrus is irritating to most arthritics. Pineapple and papaya, which are high in beneficial digestive enzymes, can be helpful. This also applies to the supplement alfalfa. Food allergy may be a major factor. As many as half of all arthritics tested received excellent relief just from removing allergic foods from the diet. The most common culprit is milk, followed by wheat, gluten, eggs, corn, and pork. However, any food can cause the problem (Your nutritionist can help you find the offending food). If you have a relapse due to a food, bear in mind that it can take as long as five days to start experiencing a reaction. This is especially true of pork. Minerals in foods: Lack of calcium or too much phosphorous can activate the parathyroid gland, which pulls calcium from your bones and deposits it around the joints. It’s very important to keep your phosphorous intake low. The highest phosphorous foods are carbonated beverages and red meats. Calcium is also bound up by foods high in oxalic acid (asparagus, raw spinach, raw chard and the water from cooked spinach). Alcohol greatly aggravates arthritis. In addition to being highly acidic, it also uses up B vitamins and magnesium, very important nutrients for the arthritic. Reducing salt intake reduces pain for many people. Salt is known to irritate the nerve endings, increasing sensitivity to pain. Tumeric has been found to be effective against acute and chronic pain. It appears to block inflammation pathways. Ginger also has anti-inflammatory properties. Add turmeric to brown rice while cooking, and add fresh ginger to soups. Coconut oil and oregano oil are excellent natural anti-bacterial alternatives for clean gums. 1. Virgin Cod Liver Oil or Rosita Extra Virgin Cod Liver Oil: Strong anti-inflammatory and crucial for building good prostaglandins. 2. Shaklee Alfalfa: A highly alkaline food, and is also rich in digestive enzymes and a powerful anti-inflammatory; it also helps you make your own natural cortisone. Available at Swanson Health Center. 3. Pure Encapsulations B-complex: Gives remarkable relief to some people. Possibly, the reason stress triggers arthritis is because it uses up B vitamins. B complex also increases prostaglandin production. Especially helpful for rheumatoid arthritics, arthritis caused by any type of allergy, and for people who have had cortisone. 4. Thorne Research Vitamin C with Flavonoids: Eases pain for many people. It helps build bone and collagen, is an important free- radical scavenger, and helps B Complex fight stress. Aspirin and cortisone both use up large quantities of C.